Every child wants the chance to kick a ball, to throw it well and to share that success with family members. Every child with intellectual disabilities wants the exact same thing. Young Athletes Play Days are designed to provide play activities and socialization opportunities for children with intellectual disabilities between the ages of two and seven. 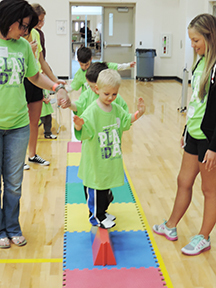 Play Days were created to serve children too young to participate in formal Special Olympics events (athletes can begin competing at age eight). Young Athletes Play Days are a wonderful introduction to Special Olympics. Children participate in 10 different activities, representing 10 different sports offered by Special Olympics. The program helps increase the young children’s strength and coordination for sports while introducing them to group play, cooperation and awareness of rules. Teachers are encouraged to register their entire classroom to attend a Play Day. Mainstream and special education students are welcome to attend. If a child is in your classroom who is older than eight, they are also welcome to attend. Children can also register individually.